WASHINGTON, D.C.—The National Building Museum will present its Honor Award to Madison Marquette and Boys & Girls Clubs of Greater Washington at its annual gala on May 31, 2018, for their transformative vision and profound commitment to our local communities. Amer Hammour, chairman and founder, Madison Marquette, and the 2018 Youth of the Year for the Boys & Girls Clubs of Greater Washington, will accept the award on behalf of their organizations. The evening’s festivities will be emceed by Dr. Johnnetta Cole, president emerita of Spelman and Bennett Colleges, and will also feature a tribute to Jim Fetgatter and the Association of Foreign Investors of Real Estate (AFIRE). Honor Award recipient Madison Marquette is known across the United States and the world for its innovative approach to placemaking and for its uniquely distinctive incorporation of retail into mixed-use projects. Since its founding in 1992, and under the leadership of chairman Amer Hammour, Madison Marquette has delivered compelling mixed-use destinations that succeed by preserving neighborhoods, maintaining historic authenticity and inspiring communities. The second awardee, Boys & Girls Clubs of Greater Washington (BGCGW), aims to help young people reach their full potential as productive, responsible adults. They manage 12 Clubs that serve as safe havens for over 13,000 youth when school is out. BGCGW offers programs that teach participants about energy and urban infrastructure, money management, and career planning, and host hands-on labs and engineering challenges. They deliver measurable impacts in the community and in the lives of those who need it most. Ninety-nine percent of Class of 2017 Club members graduated from high school and 82% of graduating seniors planned to pursue post-secondary education last fall. Celebrating their 30th anniversary, the gala program also includes a special tribute to the Association of Foreign Investment in Real Estate (AFIRE). AFIRE is comprised of more than 200 members, from 22 different countries, who are among the largest international real estate investors in the world. Their aim is to ensure that foreign investors are informed, that global markets are competitive, and their advocacy work has been instrumental in spurring the revitalization we are witnessing today throughout our great cities. 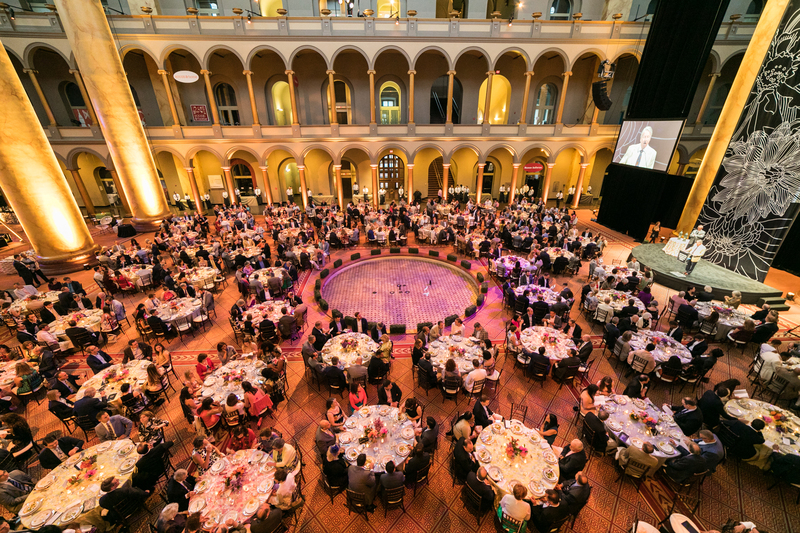 The National Building Museum bestowed its first Honor Award in 1986 to recognize individuals and organizations that have made important contributions to the nation’s building heritage. Recipients are selected from a wide variety of backgrounds to call attention to the many factors that determine the form and quality of the built environment. The first recipient of the Honor Award was J. Irwin Miller in 1986. Other past honorees include Lady Bird Johnson, Senator Daniel Patrick Moynihan, Cindy and Jay Pritzker, New Orleans Habitat Musicians’ Village founders Harry Connick, Jr. and Branford Marsalis, DuPont, the Rockefeller Foundation, and The Associated General Contractors of America. This year’s Annual Gala includes a late-night after party, featuring live music, open bar, late night snacks, and dancing until midnight. Madison Marquette is a leading private real estate investment manager, developer, operator and service provider headquartered in Washington, DC. Founded in 1992, the company’s reputation is built on the successful development, repositioning and redevelopment of commercial mixed-use assets in major gateway and emerging high-growth markets throughout the United States. Madison Marquette partners with global institutional and private investors to achieve industry-leading investment performance across asset classes. In addition, the firm provides integrated management and leasing services to many of the most sophisticated institutional owners in the industry. On behalf of owners and investors, Madison Marquette provides insight, and often innovative incorporation of retail, that results in high-performing and unique real estate destinations that add long-term value to their communities. Current high-profile projects include The Wharf in Washington, D.C., the redevelopment of the Asbury Park waterfront in New Jersey, and Pacific Place in Seattle, WA. The firm covers major U.S. markets through its primary offices in Washington, D.C., New York, San Francisco, Los Angeles, Seattle, and Fort Lauderdale. Madison Marquette is a member of the Capital Guidance global group of companies. Boys and Girls Clubs of Greater Washington’s (BGCGW) 12 Clubs—covering a territory of 75 miles that stretches from Manassas to Germantown—serve as safe havens for our members. The Clubs are open when schools are not, and provide a safe, comfortable, and fun alternative to youth who would otherwise be home alone or on the street. Over 1,200 youth attend the Clubs for activities every day to spend time with positive and encouraging adults. The mentor relationship with staff is making an impact on their lives: 99% of Class of 2017 Club members graduated from high school and 82% of graduating seniors planned to pursue post-secondary education last fall. Clubs are open after school on weekdays, some have Saturday hours, and many offer full days during school holidays and summers. Clubs welcome every child, adolescent, or teenager for a nominal annual membership fee, but will not turn any child away for inability to pay. AFIRE is the official voice of the foreign real estate industry in the United States. The Association of Foreign Investors in Real Estate (AFIRE), founded in 1988, is the official voice of the foreign real estate industry in the United States. Representing the “who’s who” in the global real estate investment industry, AFIRE provides a platform for top investors to communicate through global meetings in the US, Europe, and key cities around the world. From market trends, legislation and tax regulations to informative publications and resources, AFIRE covers the most important current topics of interest to ensure that the foreign investor is as informed as the domestic investor.